Google's podlike vehicle looks like something out of a Disney Pixar movie. Google says it is ready to take its fully autonomous prototype vehicle on the road, but the company has yet to apply for the required permit in California. The company is testing the autonomous Lexus RX 450h crossover on roads in Mountain View, Calif., and a Google spokeswoman said today that the prototype will follow the same path. California started allowing self-driving vehicles on the roads in September with the requirement that all autonomous vehicles apply for and receive permits from the Department of Motor Vehicles. 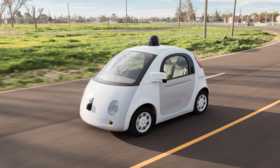 A California DMV spokeswoman said that Google has yet to apply for the permit for its fully autonomous prototype. This week, it was reported that Google’s autonomous Lexus RX 450h, which has been through real-world testing, was involved in three fender benders on California roads since September. Google told Automotive News that its self-driving Lexus was not at fault in any of the crashes, but would not release details. The company’s new prototype uses the same software as the RX 450h, Google said in a statement today. But the Google prototype is built for autonomous driving, and the RX 450h is a vehicle to which sensors have been added, a Google spokeswoman said. Google’s podlike vehicle looks like something out of a Disney Pixar movie, with black domes on the roof and hood that hide the sensors the car uses to navigate roadways with the help of maps and software algorithms. Google says its prototype is limited to a top speed of 25 mph, and during this testing phase Google drivers will ride in the vehicle with a detachable steering wheel, accelerator pedal and brake pedal to allow them to take over if necessary.